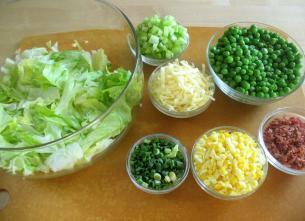 In a very large serving bowl, put broken lettuce pieces in the bottom (as much lettuce as desired). Add on top the cut-up celery, then layer with chopped onion, layer the blanched peas on top, then layer the mayonnaise to cover completely the top, edge to edge. Sprinkle sugar and garlic on top of mayonnaise; then sprinkle all the sharp cheese on top with bacon bites last. Cover tightly and keep overnight in the refrigerator. This stays well and tastes better 2 days later! Posts on this blog may contain affiliate links for various companies. When you shop through one of my links, you are helping to support this blog. Thank You! Copyright © 2019 Grandma Raised In The South. All Rights Reserved.